The giraffe (Giraffa camelopardalis) is an African even-toed ungulate mammal, the tallest of all land-living animal species. 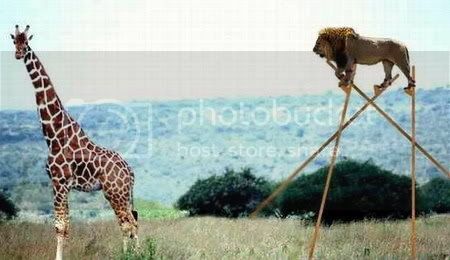 When it is said that the lion is one of the giraffe's worst enemies. 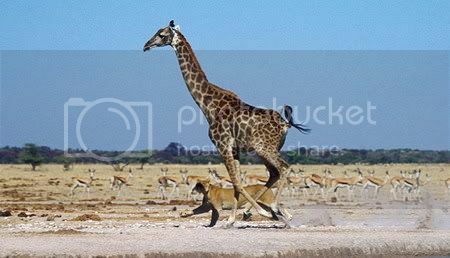 But these giraffe's can outrun any but the swiftest horse, thier thick skins often stopped the bullets from the poor sort of guns, and their long neck keeps the lions from getting near the herd. The lion knows this and lies in wait for them at their drinking places. If he misses when he leaps at one of them, they may drive him off or even kill him by kicking him. Usually, however, they run from lions as fast as they can. So... how does the lion solve this problem?